OK. Time to sit back and take a chuckle break! Some of you may have seen this on TV by now but I doubt you’ve seen the “extra” footage. His outtakes are almost as cute as he is. Oh, the things celebrities put up with! Could This Be the “iYacht”? American Luxury Magazine (from which you can view additional photos) recently sent out an e-newsletter featuring a variety of super-luxurious items. Among them was a select group of photographs featuring Steve Jobs’ yacht. Yet again, creativity and innovation done the Apple way. 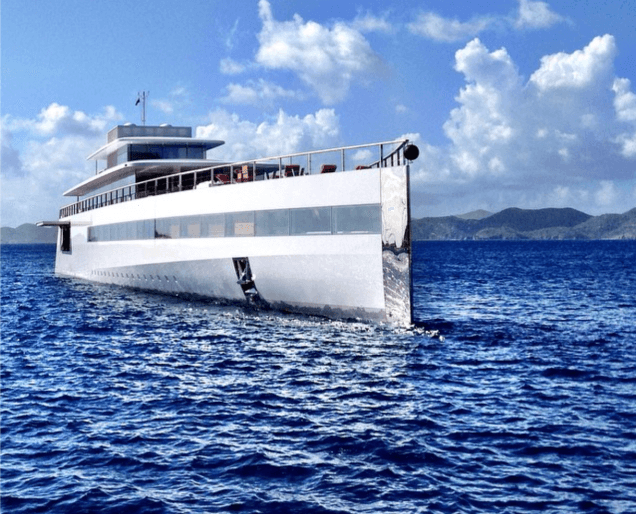 A 256-foot yacht designed for the late Steve Jobs was captured in numerous photographs as it sailed in to the British Virgin Islands. The yacht, called Venus, was designed by Philippe Starck. Jobs reportedly commissioned the building of the yacht after sailing on his friend Larry Ellison’s Yacht. The yacht was not finished until 2012, nearly a full year after Jobs’ passing. The yacht has six bedrooms and features high-tech automation systems. The exterior is crafted from aluminum and steel and looks strikingly similar to an Apple product. The yacht is now owned by Jobs’ widow Laurene Powell Jobs. If you haven’t seen or read about Apple’s proposed new campus in Cupertino, CA, this “sneak peek” via Wired magazine will give you something to contemplate. Recently Cupertino city officials gave the go-ahead on development of this new campus. This blog is partially about innovation and all things creative. When I read this article and looked over the sketches of the soon-to-be “Apple Campus 2,” I began to think of new versions of how that iWord could be applied. 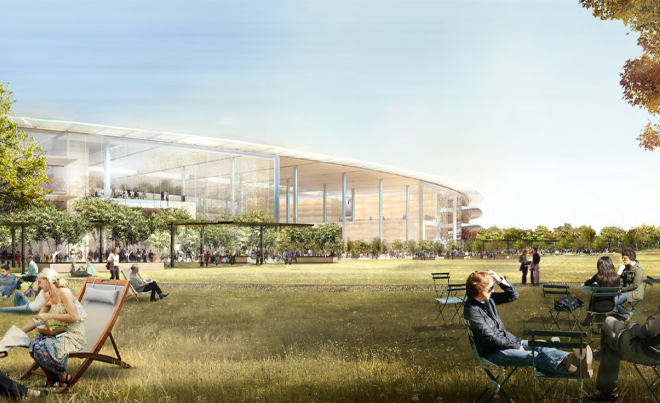 Quoting from Wired, “At this point, there’s a good chance you’ve seen pictures of Apple’s proposed new headquarters — a 2.8-million-square-foot spaceship parked in a verdant man-made forest in the northeast corner of Cupertino. Since the first dozen or so renderings trickled out in 2011, however, we haven’t gotten a much better sense of what all the new campus will entail or what it will be like to work there. “Apple may be known for its secrecy, but buried in Cupertino’s municipal archive is a wealth of detail on the project — including more than 20 previously unseen renderings of the new campus. “Seen for the first time is the space port-like entrance to the development’s subterranean parking lot, a cavernous cafeteria that spills into the grassy landscape beyond, and the glass pavilion that will serve as the entrance to Apple’s new underground auditorium — a secure lair where press will gather for future product launches. Progress would suggest that more buildings will be developed across the country with the same environmental and creative foresight the folks at Apple are showing with this design. Architects and designers should never feel constrained about introducing new elements into the work place. Yes, money will always play a significant role, but isn’t it more important to develop an environment that is not only welcoming to Mother Nature, but inspiring to employees (and stockholders). As you’re nodding “yes,” and you should be, keep in mind that society needs to do more of this. It’s not always about the bottom line. Now, here’s a peek at the forthcoming mothership. Enjoy! The iPod, iPhone, iPad, and now . . . the iDesk? Since this blog talks about and attempts to showcase creativity and innovation, the following piece came to my attention via a newsletter from American Luxury Magazine. Give it a read sometime. I couldn’t resist sharing this. It’s really cool and yet hard to believe it’s just a concept. For now. Mac|Life (another good publication) has come up with the iDesk, a desk where much of the normal clutter on your desk will be replaced by apps and widgets. It is essentially a huge iPad. 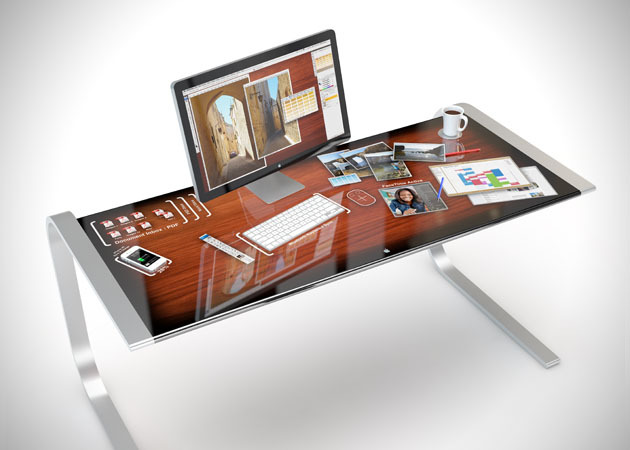 According to Mac|Life, the entire top of the desk is a touchscreen that can sync with all your iOS devices by just placing them on its surface. You will have the option of using a digital touchscreen mouse and keyboard or sticking with a traditional keyboard and mouse. The iDesk will have apps available for everything you need, from setting reminders or marking dates in a calendar, to posting updates on Facebook or sending out emails. Custom desktop themes would allow you to give your desk a classic look or you can work on the water. 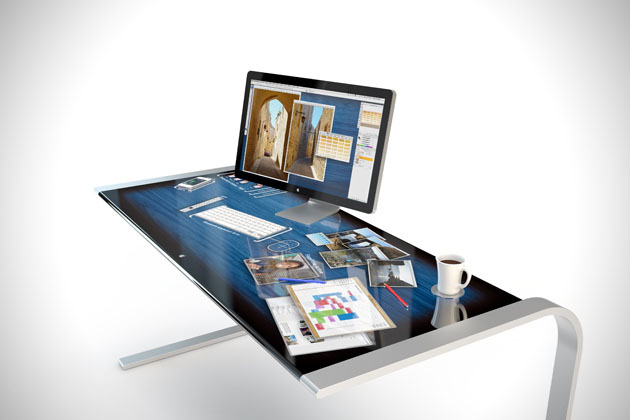 The iDesk is still just a concept, but considering the Microsoft Surface windows-based touch-tables have been available for awhile now, it could be hitting Apple Stores sooner rather than later. So what do you think? Will this be something to which consumers would be attracted? Innovation, at times, can be fickle. So what? Kudos to the Mac|Life gang for bringing this to light. Depending on the price (if it ever gets that far), this reminds me of something appropriate for the Neiman-Marcus Christmas catalog. When we fail to fail, we fail. Creativity suffers. In his recent talk before the Ad Age Small Agency Conference, Dan Wieden, co-founder of Wieden & Kennedy in Portland, OR, stressed the importance of failure, or, rather, the freedom to fail. Talking about his agency’s mantra, “fail harder,” Mr. Wieden referenced the significance of one making three collossal mistakes before moving on to more fruitful creativity. He mentioned how mistakes are too often seen as marks of stupidity, instead of building blocks of knowledge. I know, not everyone feels they have the flexibility to make ONE mistake, let alone three or more. That’s a scary thought! Consistent barriers seem to be erected that prevent us from experiencing failure. Some are self-imposed, while others are insinuated by organizations and companies with which we work or perform services. Time to fail is rarely included in the timeline for producing most projects. Everyone wants results now, not three days from now (at least, that’s how it feels at times). Yet, one must be diligent in expressing doubt that a hurried or tight timeline would include time to fail. In today’s fast-paced business climate, failure doesn’t seem to be tolerated. “We don’t have time to fail,” seems to be the business mantra. Ah, therein lies the rub. When it comes to creativity, those of us practicing it everyday don’t seem to be allowed to think about failure. Yes, I admit it – I did not achieve perfection on the first draft of my _________ (fill in the blank with design, article, illustration, photograph or whatever). Companies like Nike, Apple, Pixar and even others much smaller in size, openly embrace failure and incorporate it into their systems. Those who don’t engage creativity everyday, seem to think that it’s some commodity one can easily switch on or off at will. This attitude does a disservice to those involved in practicing the craft as well as for whom they are practicing it. It’s unrealistic to ignore failure. It’s unrealistic not to schedule time for its possible appearance. It’s reality that we need to learn from the process to improve upon what we just created. We need to make time to do that, and then move on. 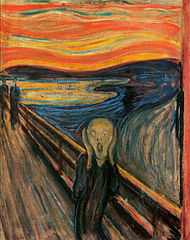 The other reality: Will anybody really care?